Are you ready to turn it up to 11? We are. Get ready a series of awesome learning and music making modules exploring creative music production processes, modeled using the music of Peter Gabriel! This post will familiarize you with the logistics of the course, get you sorted with the tools you need, and help you get to know your fellow PWYM participants. We’re Alex, Ethan, Vanessa and Dirk (collaboratively known as “Mister Mix”). You’ll see us in the PWYM community and popping up over email. Think about us as your “backup band” for the course. You’ll be learning from each other here, not us! For the next 10-12 weeks, you’ll receive emails from “Mister Mix” with links to the modules in this course. At the beginning of the week we’ll drop a line with an assignment and supporting materials. 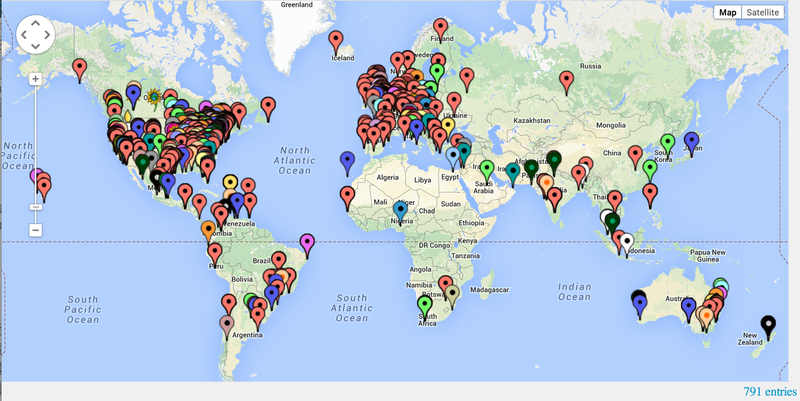 Please Introduce Yourself to the community and drop a pin near where you're from over at our interactive course map. Your Learning Ensemble. The colleagues you meet and join with here at #PWYM comprise your "learning ensemble." Lean on them for feedback and support as you make your way through our modules. Soundation and SoundCloud. These accounts are free, and we’ll be using them to make and share your sounds. Please sign up, and join the SoundCloud group we’ve put together for the course. #PWYM Community. If you have questions your small group can’t answer, or want to share resources with the wider [#PWYM community], we’ve set up just the place to do that. if you'd prefer, join our Google+, Facebook, and Twitter communities. Save the date for our first live interviews with Peter Gabriel collaborators Kevin Killen and Jerry Marotta. We'll be live streaming from NYU on Tuesday, May 20th from 2:30-4:30pm EDT/NYC time! The interview will be archived if you can't watch live. We want to hear from you for the questions we'll ask Kevin and Jerry. Please share them in reply to the Questions for Kevin and Jerry topic in this category. Read through the rest of the topics in this module and submit your questions for Kevin and Jerry. Nice to be here and looking forward to playing/learning. Presently using Garageband w/ an M-Audio Fast Track Pro interface, Acoustic, Electric and Bass Guitar. Composing mainly on Acoustic w/ a few on Bass as well. About 10 tunes fully realized/written and 20+ lyrics written. Looking forward to the recording part of my project. Present challenge ~ getting quiet recording from my Audio Technica AT2035 microphone for voice and acoustic guitar. Sorry to appear so cynical or acerbic; but, I began the course with the frequency response test to assess the quality of my sound system, and my ears. I expected that the next step in the course was to be an extension of that experience. That apparently is not the way the course is laid out hence causing me to become rather lost. What are the "rest of the topic" in this ... Module 1B? Why is there no link to them? hello im jaime from santo domingo dominican rep...i like soundtracks and peter gabriel music too...this is an incredible oportunity , to learn some things from an artist of his height...thanks and congratulations!! Hi. Module 1 is an introduction. The next step is topic 1c., preparing for the live interviews. The next module will focus on listening for timbre and space in recordings. We have designed the course to work for a wide range of participants. Some modules may move faster or slower in terms of content as a result. We will open up the next module towards the end of next week. In the meantime, feel free to get to know the others in the community and share some resources you think are helpful. Hey Crew, who likes 90's Trip-Hop or some Deep House? I shore do. How do i find my crew? My name is Nick aka wolfmanbearpig, and I work as an Instructional Technologist for Loyola Marymount Univ in Los Angeles. I support both our school of film and television as well as the college of communication and fine arts, including majors such as recording arts, and music. I love all kinds of music from underground hip hop (especially the instrumentals), to classic rock, surf guitar, country (esp. Johnny Cash and Willie Nelson), and classical. I have a growing vinyl record collection, and I often post about music on twitter @wolfmanbearpig. Looking forward to seeing what this course has to offer, and learning from you all. Hi everyone. Really looking forward to this course. I mostly play acoustic guitar and pedal steel. I think 1980's production is the best era of recording so naturally excited about the music choice for this one. hi everyone, I'm Rudie from Brooklyn NY. I'm interested in learning how to take the electronica & dance out of my head so the world can hear it. I'm Ivan Odintsoff from Rio de Janeiro, Brazil. Big fan of music editing and #1 fan of Peter Gabriel! I already remixed some musics of PG on the RealWorld Remixed and did some other songs with own samples and from other music. My name is Adrian, I've been an EDM producer for almost 5 years. I've worked mainly in FL Studio, with a bit of Logic Pro X in the mix as well. I'm looking to bring my guitar, drums, and bass skills into the mix with live recording as well. The biggest skill i'm looking to gain is in the mastering aspect: learning about compressors, limiters, etc. I've started to look into it more, and have started to refine those skills, but only based off of presets, NOT an understanding of how these tools actually function or the proper way to use them. Hi, I'm a Product Management executive living in Columbia, MO who is interested in understanding and learning more about music. I have a technical background as well as a little bit of music training but generally this is all new. I'm really interested in seeing how my technical capabilities will augment my overall musical weakness and lack of knowledge. Hey all, my name is Cliff Allen. I'm a 29 year old student, just finished up my second year of study at a local community college here in TX, hoping to transfer to TSU within the next year or two to finish up my Bachelor's in Sound Recording Technology. I'm also focusing strongly on music theory, performance, and composition (I won a national award a couple months ago for a little trio piece called Kokopelli, hence my handle). My goal is to be a well-rounded musician and producer, hopefully it will give me a decent leg up when I have my degree and am ready to put it to use. I've been a lifelong fan of Peter Gabriel (some of my earliest memories are of dancing around to the Sledgehammer video on MTV), so when I saw this course, even though I just finished my Spring semester today, I had to sign up. Never stop learning, right? I am very excited about what is in front of us in this course, and can't wait to get my hands dirty! Hey guys, its a pleasure to meet all of you soundfreaks and musicians alike. I'm Valis, currently living in Malaysia but may relocate to Canada or the UK. I play guitar mostly and do Ableton for the other production stuff. Compose songs time to time if i'm not having writer's block. Hi guys. I'm 37 and from South Africa. I'm a musician and producer. singer/songwriter, guitarist, and jazz trumpet player. Peter Gabriel is without any question one of my biggest influences, and has been for 25 years. I think Mercy Street is the most beautiful piece of music ever written. I even had the privilege of meeting him a few years ago. what an amazing man. So… i'm here to learn. Thats about it. Haven t been producing for that long, and very very focussed on getting my mixing chops really happening. Being able to listen to the guys that mixed tunes like Sledghammer blows my mind. Very exciting. If any of you are interested in my music, you can have a listen on Sound Cloud. just search for Gavin Knox-Grant. Dude! I lived in Cabarete for a year. Just got back to SA a month ago. Will probably go back next year for a while.